Our Pirate Rogue deck list guide features the best Rise of Shadows deck list for Season 61 of Hearthstone (April 2019). Our Pirate Rogue guide also contains Mulligan advice, card combos and strategy tips. 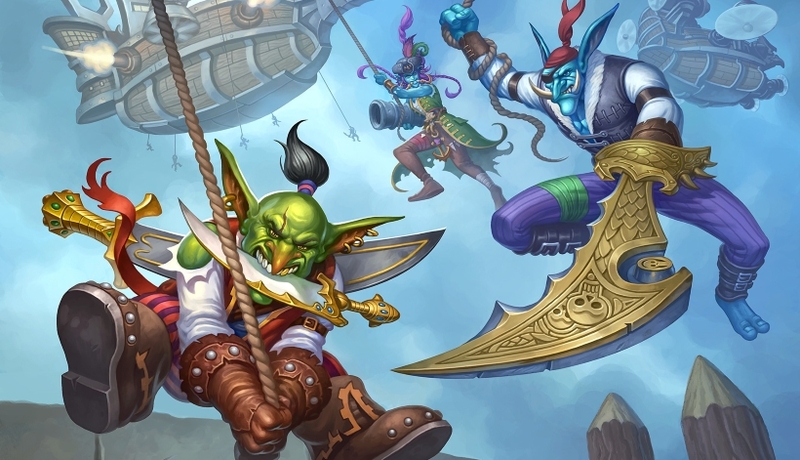 Pirate Rogue is a Hearthstone deck that's making a little bit of a comeback in the late stages of the Rastakhan's Rumble meta. Whether it proves to be quite as intimidating in the long-run as it once was is yet to be seen, but we're intrigued to see its return nevertheless. As the name suggests, your objective here is to weave together the many Pirate synergies that exist in the deck, and snowball an overwhelming threat against the opponent. In the latest version of our guide we've got the most competitive deck list seeing play right now, Mulligan advice, and details of the combos contained within the list. We'll have to wait and see what's in store for Pirate Rogue with the imminent launch of a new expansion. If the deck continues to see play, we'll have a new update for you with a deck list that makes use of the new tools. It's going to take some time to properly convert Metabomb for Rise of Shadows, but here's a Pirate Rogue deck list created by corbettgames for the start of the new meta. Don't craft anything until things have settled down! Everything below this point refers to an earlier version of Pirate Rogue and will be updated once the launch window is behind us. 1. Fire Fly: An ever-popular early game minion that contests the board, while providing a combo token for later use. 2. Hench-Clan Thug: A potentially powerful early minion that grows in stature with each swing of your weapon. 3. Raiding Party: This card does so much for three mana - and can have such a huge impact on the game - that it’s worth keeping in the Mulligan phase. - Any spell you cast after playing Preparation will have its mana cost reduced by three. Raiding Party and Myra's Unstable Element are common combos with this effect. - Each time you take a swing with your weapon, Hench-Clan Thug will gain an extra +1 / +1 of stats and can become an intimidating threat for your opponent. - The following cards require another card to be played first on the same turn if you want to achieve their bonus effect: Eviscerate, Raiding Party and SI:7 Agent. - Raiding Party will draw two Pirates from your deck at a base level, but when used in a combo it will also draw a weapon from your deck - and that's guaranteed to be Shadow blade in this precise version of Pirate Rogue. - For each card you played earlier and on the same turn, Edwin VanCleef will gain an extra +2 / +2 of stats. - The mana cost of Dread Corsair is reduced by one for each point of attack on your weapon. You can very easily buff the attack on Shadowblade with Deadly Poison, meaning Dread Corsair will cost nothing whatsoever to play. - When put Fal'dorei Strider onto the board, three 4 / 4 spiders get shuffled into your deck. If one of those gets added to your hand, it'll automatically be fielded onto the board. Myra's Unstable Element has clear synergy in this context. - Captain Greenskin grants your weapon an extra point of Attack and Durability when played onto the board. - Be cautious about over-drawing when putting Myra's Unstable Element into play. Remember too that you'll enter the Fatigue system once thinning your deck down to nothing! Here are some alternative cards that sometimes see play in other versions of the deck. Preparation: Offers a huge discount on many of the deck’s more expensive spells, so you can play them earlier. Deadly Poison: An vital buff for Kingsbane that will steadily build up its damage potential. Doomerang: Can deal some serious damage to a minion if you’ve been buffing up Kingsbane. Kingsbane: The card the deck is built around. Its Deathrattle means you’ll just send it back to your deck once the Durability is spent, and all those buffs will stick around for the next time you draw it. Cavern Shinyfinder: Guaranteed to pull Kingsbane from your deck. Very useful if you can’t find it in your opening Mulligan, or need to fish it back out again in the late game. Leeching Poison: Another buff for Kingsbane. This gives you the sustain you need to survive into the late game if you focus heavily on minion trading with the weapon. Raiding Party: A new spell from Rastakhan’s Rumble that fits perfectly into the deck. If you use it with its Combo effect you’re effectively drawing three cards for three mana. That’s value! Dread Corsair: Once Kingsbane hits four Attack you’ll be able to play these for free, which can set up a huge tempo swing in your favour. Captain Greenskin: Great weapon buff with the Durability bonus. Greedy players will enjoy casting Vanish to put it back into your hand to reapply the buff again. Valeera the Hollow: Offers some survivability in the late game, and sometimes that one extra turn is all you need to secure the win against faster opponents in particular. @Orcchi Hi there thanks for alerting us to this. I've made the changes. RE: The image issues, you may need to refresh your browser if you've spent a long time on the page and reviewed many cards. There's no quick fix for this at our end but it is something we're aware of. There are some mistakes in this article, can you please double check when you post something? Maybe put in sap for strong taunt minions?